Taking part of its name from the French word, touiller (‘to stir’), this delicious vegetable stew is the kind of dish you can enjoy cooking on a lazy afternoon – chopping, sauteing, stirring, tasting, until all the vegetables are soft and tender, and you’ve got the flavour just right. 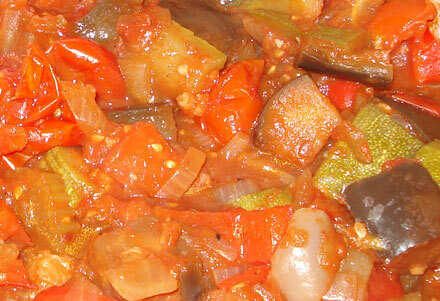 The key to making ratatouille is enjoying it – don’t regiment quantities or chopping. Start with heating a large, thick-bottomed pan on a medium heat and add a slug of olive oil, then simply start chopping and adding your ingredients to the pan in the order they are listed above. I have found that the best size to chop vegetables for ratatouille is about an inch for everything bar the onions, which you should cut into the normal small dices you would use when making any sauce. Keep stirring as you add each element, and introduce the lid ever so often to keep things extra moist. It’s a satisfying process to see your ratatouille build up in the pan, and watch the vegetables saute and soften together, sharing flavours and juices. Once everything but the tinned tomatoes have been added, let it all cook together for 20 minutes or so, stirring every so often. Finally, add the tinned tomatoes. I suggest adding the cherry tomatoes first, incorporating them into the ratatouille and then deciding whether you need the second tin. It depends how juicy and tomatoey you would like your ratatouille to be. So, now it’s ready, choose how to serve it. Crusty bread is a delicious accompaniment that will soak up some of the lovely juices. 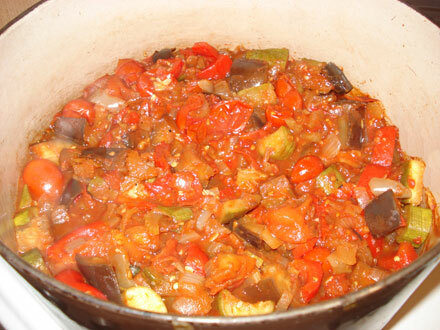 Grated cheese scattered over the top will melt all over the ratatouille, giving it a creamy dimension. The possibilities are endless, but all will be satisfying and delicious.